THE beginning of the year is as good a time as any to reflect upon the direction the country is heading towards. Ten years ago, Malaysians were just beginning to appreciate the opening up of public space. Then prime minister Tun Abdullah Ahmad Badawi, or more familiarly known as Pak Lah, had taken over in 2003, and then won a landslide victory for the ruling Barisan Nasional in 2004, riding on a wave of public confidence in his commitment to reforming a government that had lost a whopping 14 parliamentary seats in the previous 1999 general election. What was most distinct about his administration was his promise to clamp down on corruption and therefore empowering the anti-corruption agencies. Related to this was the general change in the sociopolitical air – civil society felt freer and more able to organise public seminars related to various issues previously deemed sensitive. Modelled after Hong Kong’s Independent Commission Against Corruption (ICAC), it was meant to be a more robust agency now given greater teeth to fight graft in the country. The MACC did go through significant challenges, chief of which was the incident in 2006 during which political aide Teoh Beng Hock was found to have fallen to his death at the MACC Selangor headquarters in Shah Alam. Embroiled in controversy, the investigations and court cases eventually concluded that it was, in fact, a homicide that took place. 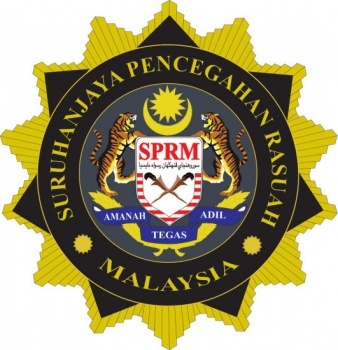 Although the police did not eventually find the perpetrator, the MACC as an institution did take measures to improve itself after admitting there were flaws in its system. One of the reform measures was to set up five independent committees, namely the Anti-Corruption Advisory Board, the Special Committee on Corruption, the Complaints Committee, the Operations Evaluation Panel, and the Consultation and Corruption Prevention Panel. These committees would be tasked to provide oversight to the operations and investigation processes of the MACC, and many individuals of good public standing were appointed to fill these positions subsequently, although these mechanisms did not sufficiently boost public confidence. Over the last year, the MACC has been in the spotlight for numerous reasons, having investigated 1MDB and other cases related to it, but then later raided by the police for reportedly having leaked documents. Has the anti-corruption commission that was initially promised to be reformed and strengthened all those years ago instead been eroded and weakened? The MACC in fact ought to be an independent institution given the resources to fight corruption. But the 2017 budget saw a laundry list of financial cuts, including in investigation and surveillance, law and prosecution, prevention, administrative and forensic services, as well as record and information management, and community education. How is it possible for the MACC to continue functioning with the same expectations but with a much lower budget? One of the core reforms that some of us in civil society have called for in recent years is an independent MACC that reports to Parliament and has greater autonomy both financially and in hiring and firing its own staff. The MACC currently reports to the Prime Minister’s Department, which surely is a source of potential conflict of interest. Having a truly independent MACC would allow it to truly exercise its duties in an unbiased fashion without fear or favour. The new MACC Chief Commissioner, Datuk Dzulkifli Ahmad, recently announced that he wants to combat corruption and abuse of power, saying that “for those who are still intoxicated by bribery, please listen to this warning: stop the corruption and power abuse, and surrender yourself!” In the same speech, he also urged Malaysians to support the agency in its mission. The MACC’s recent action in the Sabah Water Department corruption case is a good sign that it is taking steps in that direction. However, the MACC simply cannot carry out this task alone. The experiences over the last decade would surely have taught the administration some lessons: that apart from the government it serves, positive public perception is crucial to achieving its goals. Working with, instead of against, the community that it tries to educate is crucial if it wants to seriously fight corruption all round. This is where independent civil society organisations can in fact come in to support the MACC in its efforts to fight corruption. Other expert bodies like accountants and lawyers can also support MACC’s work as many investigations involve technical and forensic accounting matters. However, the MACC must also demonstrate its willingness to have frank discussions and dialogue with civil society. The MACC has seen tremendous transformations over the last decade and more, but fighting corruption seems to be even more challenging than ever. It is hoped that it is in these trying times partnerships and collaborations can be forged; all those in favour of fighting corruption – and this must be a priority this year – should surely come together. The tentacles in the war against graft are spreading wide. Four Immigration officers who listed normal people as disabled, pocketing the RM200 application fee in the process, have been nabbed; a senior official from the Malacca Historic City Council is under probe; policemen who took bribes have been charged; and the Inland Revenue Board has also joined the fray, striking up a partnership with the Malaysian Anti-Corruption Commission. PETALING JAYA: Four Selangor Immigration officers were entrusted to receive and process applications for international passports. Nabbed: Malaysian Anti-Corruption Commission officers escorting four Immigration officers out from the Shah Alam magistrate’s court after they were remanded for six days. Having access to the applicant database, they did much more than their job scope. The quartet would pocket the RM200 international passport application fee received over the counter by “converting” the paid applications to that submitted by OKU (disabled) persons, who are entitled to free passports. The officers had been pocketing large sums this way since 2014, with about RM1mil siphoned off. An internal audit exposed the ruse recently. The Malaysian Anti-Corruption Commission (MACC) raided the Selangor Immigration Department office in Shah Alam at 3.30pm on Monday and detained the four officers, two of them women. The four suspects were brought to the Shah Alam magistrate’s court to be remanded for six days. The investigation is under Section 18 of the MACC Act 2009 which involves submission of false claims with intention to deceive. “We do not rule out the possibility that such fraud may also be occurring in other Immigration offices all over the country. “This is not an isolated case and must be addressed,” he said. An MACC official said the suspects were believed to be involved in the submission of payment vouchers with falsified information. “The record is altered to show that the applicant is an OKU when he or she is not,’’ the official added. 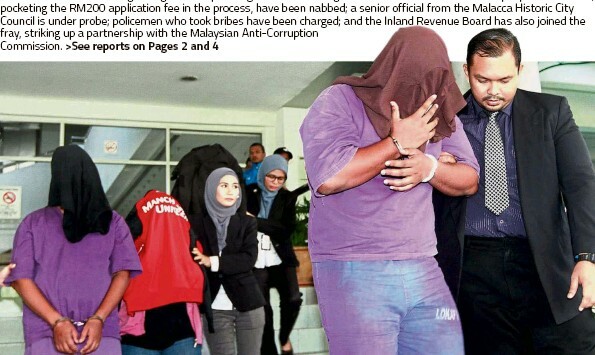 PETALING JAYA: Four Immigration Department front-line officers who are believed to have siphoned as much as RM1 million from the department have been detained by the Malaysian Anti-Corruption Commission (MACC). The suspects, aged between 31 and 39, include two female officers. They were arrested at the Selangor Immigration Department at 3.30pm on Monday and have been remanded for six days beginning today. MACC sources said the officers took advantage of a fee waiver for people with disabilities (OKU) by fraudulently classifying normal applicants as OKU and pocketing the RM200 fee on each transaction. Investigators learnt the suspects have been involved in the racket since 2014 and were only recently exposed after the Immigration Department conducted an internal audit. The audit team became suspicious when it found a high number of passports issued to OKUs, and initiated a probe. So far, the status of at least 100 normal passport holders have been found falsely classified as those belonging to OKU, and this is believed to be just the tip of the iceberg, and that there were some 5,000 more cases. MACC investigators are probing assets amassed by the detained officers and believe such activities may also be prevalent at other passport issuing immigration offices nationwide. MACC deputy chief commissioner (operations) Datuk Azam Baki said today that an indepth probe on the case is ongoing. “This cannot be taken lightly as it has caused losses in government revenue. Moreover, it breaches the special privileges accorded to the disabled by the government,” he said. MACC chief commissioner Datuk Dzulkifli Ahmad said the agency will use every law in existence to prosecute those involved in graft to make it clear that crime does not pay. "Let me issue a warning ... we will not only pursue prosecution under the MACC Act, but also use the Anti-Money-Laundering Act and the Income Tax Act," Dzulkifli said in a speech at the Inland Revenue Board (IRB) today after witnessing the signing of a corruption-free pledge by IRB – the first government agency to do so after signing the Corporate Integrity Pledge in 2013. “I urge you to stop immediately or face the consequences,” said Dzulkifli, adding that even if MACC cannot prosecute a corrupt individual, he or she would not be able to escape the IRB. (From top left) A combo picture of policemen Mohd Zulkifly Mat Nor, 28, Jeffry Abdullah, 35, Zainoor Ariffin Rosli, 24 and Muhammad Farid Nordin, 28 when they were brought to George Town Session Court by Malaysian Anti Corruption Commission (MACC) to face corruption charges under Section 17 of the MACC Act. GEORGE TOWN: Four policemen were charged in the Sessions Court here today with corruption. Corporal Jefry Abdullah, 35, from the Narcotics Department of the Northeast district police headquarters pleaded not guilty before Sessions Court Judge Roslan Hamid. He is accused of trying to obtain RM1,000 for himself from Nor Esmawati Baharom as inducement not to take action against the latter’s brother in-law, Norhamni Haron by swapping a positive urine sample during a urine test at the district police headquarters. He was alleged to have committed the offense at the Narcotics Department office of the Northeast district police headquarters about 4.40pm on Mac 1 last year. Jefry was charged under Section 17(a) of the Malaysian Anti-Corruption Commission Act 2009 which carries a maximum 20-year prison sentence and fine not less than five times the bribe amount or RM10,000, whichever is higher. The court fixed bail at RM8,000 with one surety. In a separate charge, three policemen from the Datuk Keramat police station also claimed trial over a corruption charge. 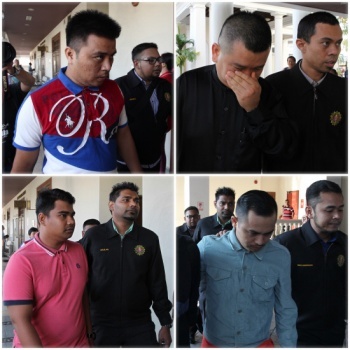 Muhammad Farid Nordin, 28, Mohd Zulkifly Mat Nor, 28, and Zainoor Ariffin Rosli, 24, with another person still at large were charged with trying to obtain RM10,000 for themselves as an inducement not to take action against Norhamni Haron for possessing ganja. They were alleged to have committed the offence at the Datuk Keramat police station on Mac 1, last year about 11.45am. The trio were also charged under Section 17(a) of the MACC Act 2009. MACC Deputy Public Prosecutor (DPP) Ahmad Ghazali Mohd Nazri suggested bail of RM10,000 with one surety for each of the accused considering the seriousness of the case. Roslan fixed bail at RM8,000 with one surety for each of them and set Feb 17 for mention. V. Partiban represented all of the accused. MACC DPP Amin Yaacub also appeared for the prosecution. Bring corrupt culprits to court fast ! Incompetence creates obstruction and leads to corruption. Countries over the world are attracting talents while Malaysia still in middle income trap, is attracting lots of cheap and unskilled labors with low productivity that attract corruption too. 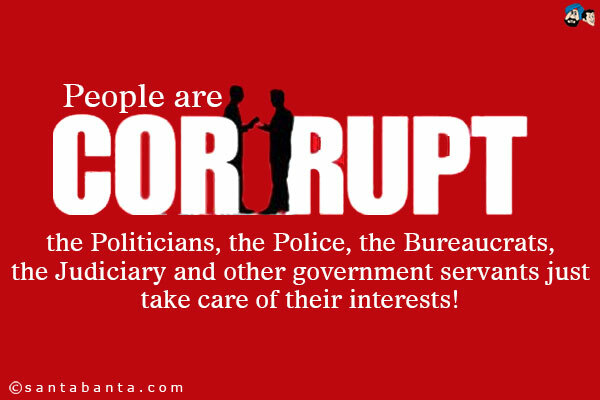 You can't simply to have high income with corrupt means! In another words, incompetence breeds corruption.